In Thailand's First Nationwide Vote Since Coup, The Generals Hold Most Of The Cards Prime Minister Prayuth Chan-ocha, who ousted an elected government in 2014, is seeking to remain in power. But many analysts say the military has sought to silence opposition voices. 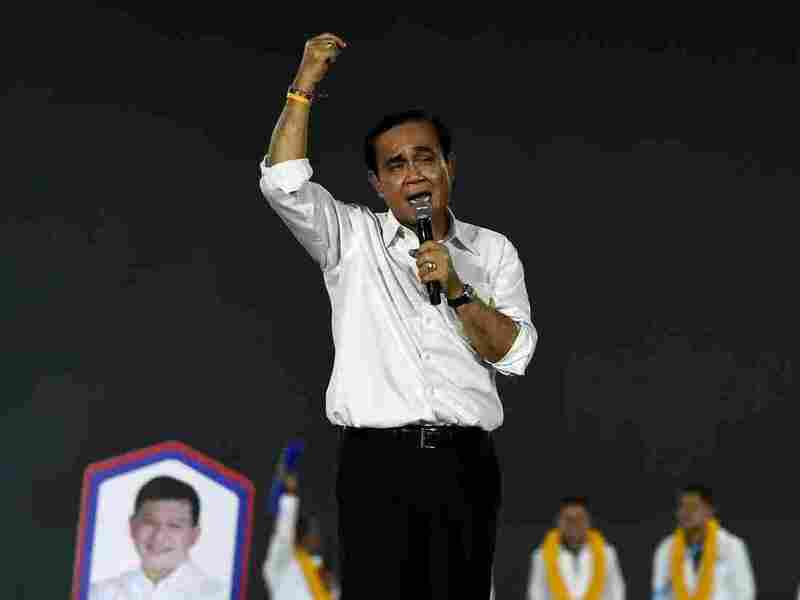 Prime Minister Prayut Chan-ocha, who ousted Thailand's elected government in 2014, speaks in Bangkok on Friday during the his last major campaign rally ahead of this weekend's elections. It's early Friday evening, at a small municipal stadium in Bangkok. The sun is going fast, but the rally for the pro-military Palang Pracharath party is just getting started. Candidate Watchara Kannika is on the stage, warning would-be voters to keep out the "liars" and vote for "the truth." That truth, he says, is the country's coup-leader-turned prime minister, Prayuth Chan-ocha, who toppled an elected government five years ago. Prayuth is Palang Pracharath's nominee for prime minister. And that's fine with 59-year-old Bangkok businessman Bunsong Tengkeaw, who is attending the rally. "Since the army took over, things have been good," Bungsong says. "It's been peaceful, without all the street demonstrations and violence from before." The economy could be doing better, he admits, but overall, Prayuth has done well. "He's stopped corruption, gone after the drug trade and done things no other government has before." Thananan Nambud, 52, is even more effusive in her praise of the military and Prayuth. "It's made us feel safe," she says. "I want him to win this election and complete his four-year term," Thananan says, "then the next one, then the one after that." Supporters shown at a pro-military Phalang Pracharath Party rally in Bangkok earlier this month. It's the first time Thais will vote in a general election in eight years. The Thai military seized power from the last democratically elected government in May 2014, promising a swift return to democratic rule. Despite Thananan's exuberance, if surveys are to be believed, pro-military parties haven't been that popular in the run-up to the election, with many Thais disillusioned by nearly five years of heavy-handed military rule and repeated election delays. Then there's the economy — Thailand's is one of the worst-performing in Southeast Asia. 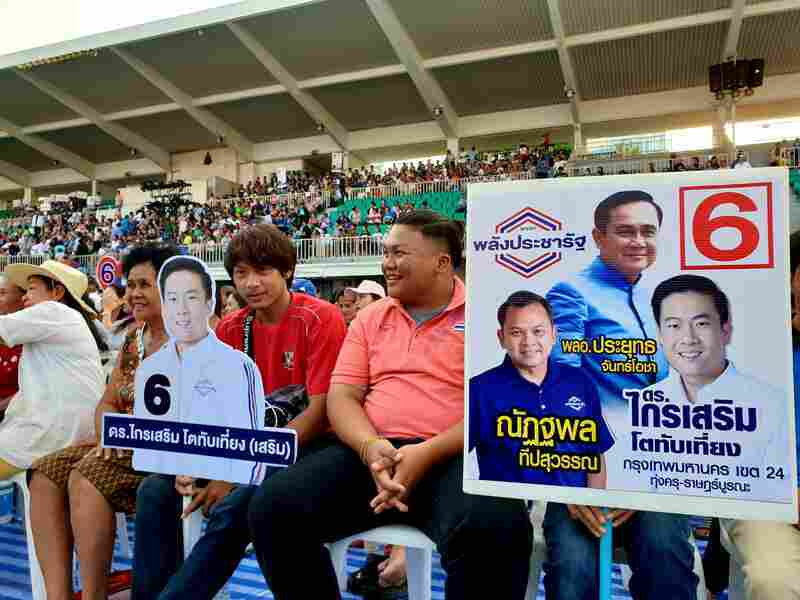 And many voters remain loyal to parties associated with deposed Prime Minister Thaksin Shinawatra, whose populist policies endeared him to many of the country's rural and urban poor. Parties who support those policies have won every general election since 2001. Will A Scandal Over Expensive Watches Bring Down Thailand's Government? But the military has had years to prepare for this election. And its aim is to drive a stake through the heart of Thaksin's political apparatus once and for all, many analysts say. "The rules are designed to produce a certain outcome for the military regime," Thitinan Pongsudhirak, a political scientist based at Bangkok's Chulalongkorn University, says. "And that outcome is to keep the one side down, away, weak and keep the military side with its parties and allies strong enough to run the government after the election." To accomplish this, the military rammed through a new constitution which ensures that the entire 250-member Senate will be appointed by the junta. And its gerrymandered voting districts and changed the way members will be chosen in the House to ensure that no single party wins an overwhelming majority — as Thaksin-backed parties have in the past. "Apart from the rules kind of crafted for the military, the referees, the agencies to enforce these rules, from the election commission to the Constitutional Court to the anti-corruption agency, they all seem to have lined up behind the government," Thitinan says. Umesh Pandey, the former editor of the Bangkok Post, agrees. "There's no way that this election can possibly be free and fair," he says. Pandey says he was forced out as head of the English-language daily last year for being too critical of the military — a charge the newspaper denies. He later joined the Thaksin-friendly Thai Raksa Chart party, which was dissolved by Thailand's Constitutional Court earlier this month after nominating a former princess as its candidate for prime minister. Pandey worries that another anti-junta party may be in the generals' political sights: Future Forward, led by a charismatic 40-year-old billionaire, Thanathorn Juangroongruangkit, who's no friend of the military. His party is increasingly popular, especially among young voters, seven million of whom will be eligible to vote for the first time in this election. "They have already filed cases against him," Pandey says. "They politically executed [Thai Raksa Chart], now they are looking to politically execute Thanathorn," he says, "And all this is to basically be able to get what they want." Thanathorn denies any allegations of impropriety. With the party Pandey joined now dissolved and having rebranded itself as the "Moving Forward for Democracy Movement," the opposition's organizing theme has been simple, says Thai Raksa Chart core member Chaturon Chaisang: Anyone but the military. 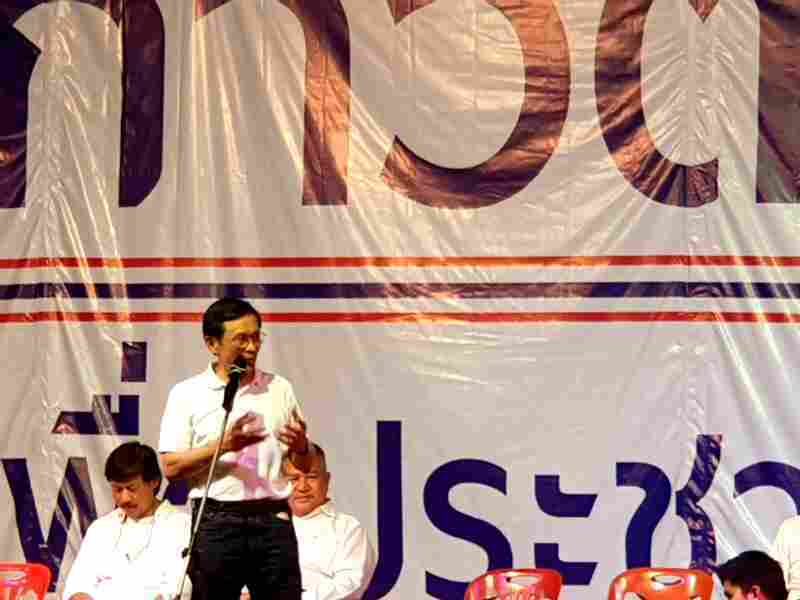 Chaturon Chaisang, former Cabinet minister under Thaksin Shinawatra, speaking at a rally in same rally in Nakhon Ratchasima. "We want to tell people that Thai people should put every effort in to halt the extension of power of the military," he says. "Meaning vote for pro-democracy political parties instead of the parties that support General Prayuth." Chaturon and the military are well acquainted. He was justice minister under Thaksin, until that government was deposed by the military in 2006. Banned from politics for five years, Chaturon then became education minister in the government of Thaksin's sister, Yingluck Shinawatra. Yingluck's government was the target of mass protests that brought the country to a standstill. She was ousted by the Constitutional Court barely two weeks before the coup, the 12th successful putsch since Thailand became a constitutional monarchy in 1932. At a rally last week in Nakhon Ratchasima — located in the Thaksin friendly northeast of the country — many listened to Chaturon's message. "At first, after the coup, I felt happy, because all the bad things that were happening stopped, and things were quiet," says 46-year-old Pitak Chompuviset. "Then they stayed one year, two year, three years, four years, after that, I'm not happy," the amulet dealer says. "If they come only six months then return power to the people, that would have been good. But they didn't." And, he says, the economy has gotten worse since the military took over as well. "Before, things were OK, we could make enough for living," he says. "Now it's difficult to earn and nobody's happy." He's voting for the largest Thaksin-linked party, Pheu Thai because when Thaksin was in power, "what they said they would do, they did," he says. "They made it happen." Ari Ongpimai, 59,agrees. "The economy isn't good at all, our life isn't good at all," she says. She grows cassava and sugar cane, but says since the military took power, things have gone from bad to worse. "Before, it was OK, we could sell and earn enough to live," she says. She's voting Pheu Thai, too. Though she says she knows the military has stacked the deck against it. "I feel sad that they've already taken 250 seats in the Senate, but we still want to fight," she says. "We will come and vote for who we want."